Affiant: A person who swears to an affidavit. Affidavit: A sworn written statement that is signed and notarized. Affidavit of Domicile: An affidavit used by the executor of a will when transferring or cashing in stocks or other investments of a Decedent. Affidavit of Heirship: A sworn statement taken under oath by an affiant. It is used as a legal document to establish the heirs of a Decendent. Affidavit of Residency: It verifies the death and residency of a Decedent to initiate the release of property of the deceased person. Affidavit of Small Estate: An affidavit used to inform a probate court that a particular estate meets the requirements of a certain state’s small estate laws. Rules of a small estate vary by state, but most range from $5,000 to $150,000 in assets. Beneficiary: A person who is legally entitled to receive benefits through a trust, will, or life insurance policy. Deponent: One who testifies under oath to the truth of certain facts or statements. Executor: The person named in a will to handle the distribution of the property of the Decedent. Heir: Someone who has the right to inherit a decedent’s property. 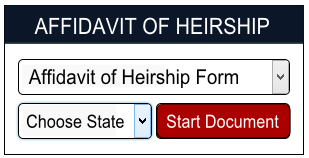 Heirship: The legal right to an inheritance. Intestate: This is when a person dies without a will. Notary Public: A licensed public official who has the right to administer oaths and certify documents. The notary’s signature and seal authenticates a legal document. Power of Attorney: An instrument allowing another person to act on your behalf. Probate: A court supervised process that follows a person’s death that prove the authenticity of the Decedent’s will, accounts for all property, makes payment of debts and taxes, identifies the heirs, and distributes the property according to the will. Trust: An arrangement where a trustee manages property for a beneficiary. Warranty Deed: A real estate deed that offers legal assurances of the validity of a property title being transferred to new ownership. Will: A legal document in which the testator specifies exactly who will receive his or her property upon death. We hope this list of legal terms benefits you when learning about or filling out your Affidavit of Heirship.